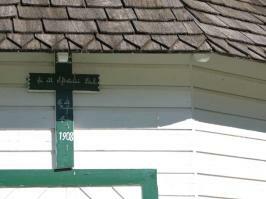 Like most churches in Manitoba, the St. Peter Dynevor Anglican Church and Cemetery in Selkirk is old – really old. Designed and built between 1853 and 1854 by stonemason Duncan McRae using stone quarried from the bank of the Red River, the church served the Aboriginal community and happened to be the home church for Chief Peguis himself. It wasn’t until 1963 when the church was restored that an archaeological dig was finally conducted in the ground below, revealing Aboriginal artifacts from centuries past. The St. Paul Anglican Church in the St. Francois Xavier may just be the quintessential prairie church – often seen paired with a glorious sunset that spans light across its surrounding green fields. And although its design is simple and fits in perfectly with its rural setting, the church’s Gothic-inspired exterior still manages to catch the eye of many passerbys. Built in 1910, the interior is completely intact and still has its original furnishings, including schoolhouse-type light fixtures, plain wooden pews and a pump organ. If the St. Malo Shrine and Grotto looks familiar; don’t worry, you’re not imagining things. Constructed between 1896 and 1902, this little gem in St. Malo was inspired by the Grotto of Lourdes in France, where devotees believe the Blessed Virgin made an appearance in 1858. Although it has since undergone a few changes on the practical side of things, with additional seating and a larger canopy, the shrine and grotto retain much of its original charm, drawing out the community for a public pilgrimage in August of each year. You’d be hard pressed to find a piece on Manitoba churches that doesn’t mention the grand Ukrainian Catholic Church of the Immaculate Conception, constructed in the first half of the 20th century. The multi-domed structure stands boldly in the village of Cooks Creek and is the most impressive “prairie cathedral-style” churches in the province. It’s no wonder that this majestic church serves as the site for the bi-annual Medieval Festival. The story of the St. Elijah Romanian Orthodox Pioneer Church dates back to 1900, when the first immigrant families from Bucovina arrived in the region without a proper place to worship. 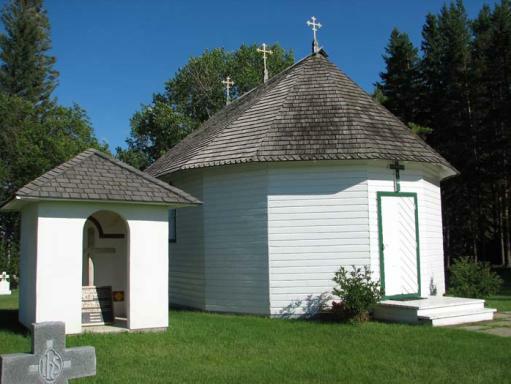 The development of a church was a slow process – with the community building a log cabin church (the second Romanian Orthodox church in Western Canada) in 1903 that was quickly outgrown by the community. Using wood from the edge of Riding Mountain National Park, the community then construction a larger wooden church in 1908, designed as a replica of the churches that were commonly found in the Carpathian Mountain region of Bucovina. When the church once again became too small to serve the local community, it was moved aside until it was discovered and restored in the 1980’s by three local descendants of the original pioneers: Maria Gabor, Peter Gaber and Andrew Onofrechuk. Today, the church is part of a museum that showcases the community that later became known as Lennard. 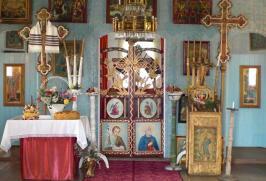 The Ukrainian Catholic Church of the Resurrection is a Manitoba icon – and for good reason. Designed by the one of the most famous church builders of Canada, Father Philip Ruh, the church shapes Dauphin’s skyline with its dramatic and distinctive roof line. What’s most incredible was that this architectural wonder was built at the height of the depression by volunteers; testament to the strength and resilience of the community. Architecturally, the church combines Byzantine, European and Ukrainian Baroque elements, with plenty of religious symbolism to boot. The Ukrainian Catholic Church of the Resurrection is open for tours in July and August, or by appointment. If you’ve driven south on Highway 75, there’s a large probability that you’ve cocked your head in surprise at the curious church situation between two roads of high speed traffic. Back in 1887, the church was built in a small town called Union Point (south of Ste. Agathe) that was as typical as small towns come with a school, a hall and a post office. Sadly, Union Point did not stand the test of time and today, only the lone church remains. Once used as a meeting place for the pioneer community, St. Andrews on the Red was constructed in 1845-49 in Gothic Revival style under the supervision of Duncan McRae. If that name sounds familiar, Duncan was also responsible for the St. Peter Dynevor Anglican Church and Cemetery in Selkirk (see the blurb above)! Today, it is the oldest stone church in Western Canada yet remains in active use, overlooking the Red River and an adjacent cemetery that serves as the final resting place for Captain William Kennedy.